During our previous trips around the world, we have traveled with a Deuter Traveler 70L Backpack (Nick’s) and a MEC 60L Backpack (Dariece’s). They worked great for us at the time. They were reliable, durable and very comfortable. However, why do we need such big backpacks? Since planning our next adventure through Mongolia, Russia, Central Asia and Iran, we’ve come to realize that we can actually pack bigger, bulkier things into a smaller bag! 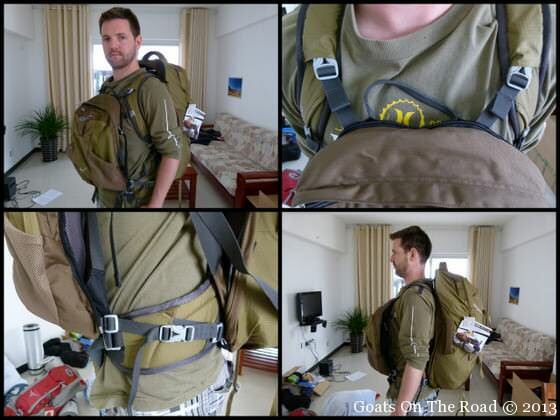 Nick’s 70L Deuter luggage entry backpack, with zip-off day bag – way too big! We recently bought new backpacks! An Osprey Farpoint 55 for Nick and an Osprey Kestrel 32 for me. These bags are awesome and have lots of extra features. We still wanted to have the clam shell style of opening (as opposed to top loaders), which these bags have. They also have lots of clips, which is perfect for storing items on the outside of the bag. My new small, lightweight Osprey Kestrel 32 Backpack! Nick’s bag has a detachable day bag that clips onto the straps of the backpack, when wearing it as a turtle shell (as opposed to him wearing it on his front, over his shoulders-very uncomfortable). I’ve downsized 28 litres and Nick has downsized 15 litres. That’s a lot less space than we had before! So, how are we planning to go trekking, camping, hiking and fishing with all of the new gear we need and have smaller bags? We are packing smarter, compressing everything and buying everything lightweight. We are literally counting and checking how many kilos or grams each item weighs. Our new backpacks weigh significantly less than our previous ones, when empty. We’ve also realized that we used to pack certain “necessities” in our backpacks and we decided to ask ourselves these questions: Do we really need to carry plastic wine glasses around the world? Do we need to carry books around? Do we need so many shirts and pants? Why did we have so many odds and ends just willy-nilly in our backpacks? 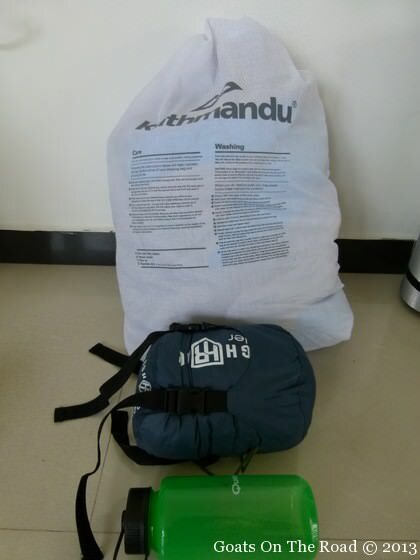 The white bag has a sleeping bag in it, by putting it into a compression bag (the blue one), it shrinks down to the size of a 1L bottle! We now have everything organized properly into either see-through Zip-Loc bags (these weigh nothing and keep things organized), we’ve purchased a Kindle so we won’t need to carry around heavy books for reading and we’ve really thought about just how much clothing we actually need. No need to pack books anymore. Our lightweight Kindle Paperwhites have arrived! Ultralight travel is the new way of doing things. Gone are the days of heavy backpacks and packing unnecessary items. 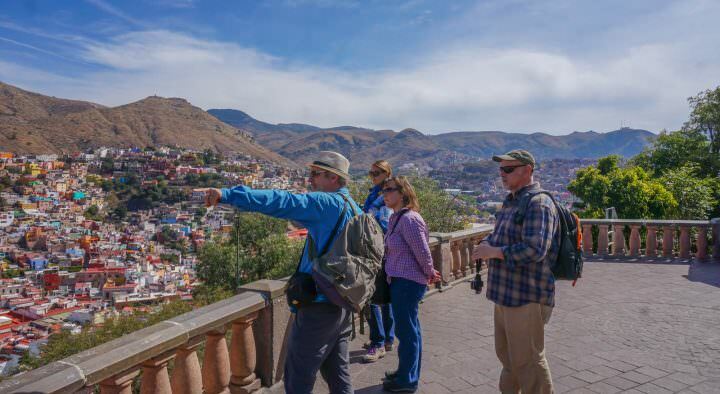 We are going from hot to cold climates and doing more activities than our previous trips, but somehow we are able to pack much less! 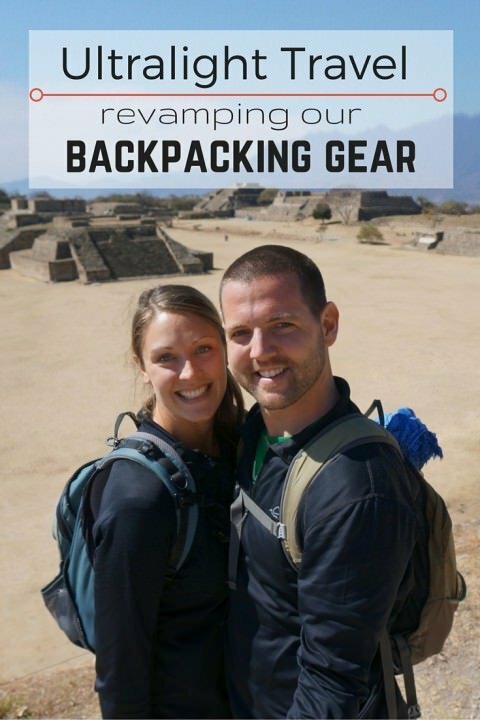 We’re really excited to travel with less gear, less weight and not carry around useless junk. When planning your next journey, really think about what you absolutely need to bring. Make sure that everything you buy is lightweight and purchase packing cubes and compression bags. These things are indispensable! What do you think? Are you an ultralight traveler? Even though I’ve never ever backpacked anywhere I agree that lighter and smaller sounds like a great idea. I have a couple of questions though. 1. 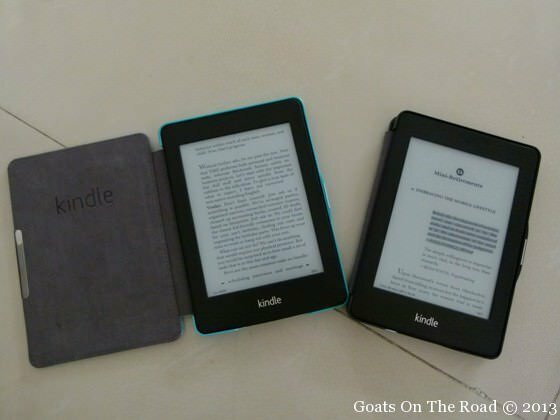 How do you plan to charge the Kindles, another great idea btw. 2 How exactly does the compression bag work? Kindles are able to be charged from our laptop, we’ll just plug them in with the usb cord. Compression bags are just basically a poly/nylon bag with sinching straps on the sides. You put clothing (or in our case, sleeping bags) into them, squish it all down and tighten the straps. Voila, a much smaller package than you would’ve started out with. OK, but then how do you recharge the laptops? Sorry it took so long but I didn’t know you replied. You should consider installing a ‘reply to comment’ plugin. Aw, thank you! I had a wonderful birthday here in China 🙂 You’re right, we are getting very excited about the upcoming trip…13 days and counting!! 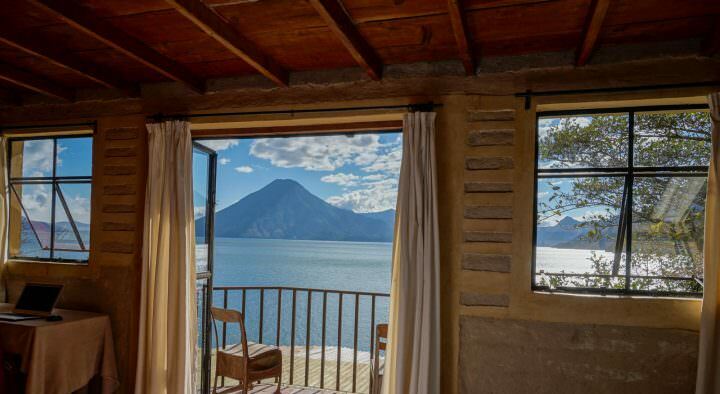 Hi guys we are looking to downsize on our next trip too… what is your packing list for this trip? What are you leaving behind that you took last time? Thanks! Down-sizing is a great thing! It’s our complete packing list for our trip. We left behind our mosquito net and a lot of clothing…but we gained a tent and lots of camping gear. We’ve been all about buying lightweight stuff, and smaller items as well. This was very interesting thank you. At the other end of my working life to you guys (is what you do actually work?) I am pondering a life wandering when I retire so this read was invaluable. What to carry has been a quandary. On a side note, while in Carita, Indonesia last year, I may have met some of your fellow travellers. 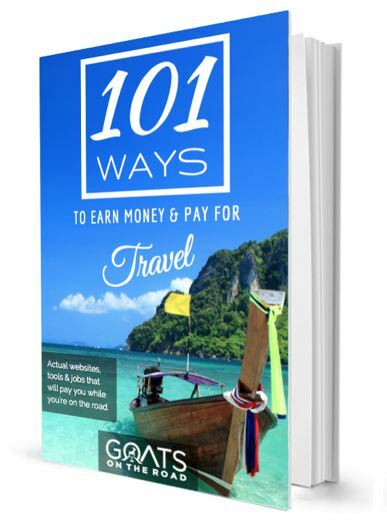 We LOVE the postcard and the shout-out to Goats On The Road! 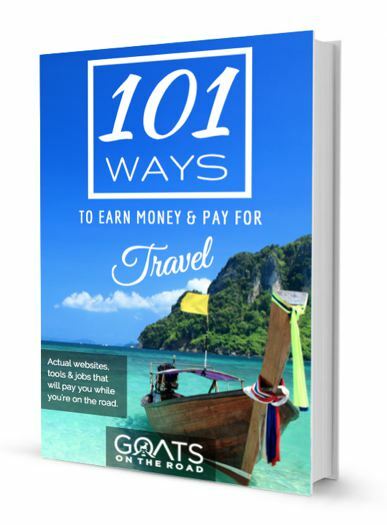 We have done a few 30 odd day holidays with 7 kgs of luggage and are hoping when we start our long term travel we will be able to have not much more than that. Our theory is we can actually buy what we need if we discover there is something missing. Am really enjoying your blog thanks for the info. You’re right about that. You can always buy it along the way….even if you think you can’t, you usually can! We’re at about 10kgs now that we’ve eaten up all of our camping food! Hey Alex, thanks for the comment and compliment. Our bags are 40L & 32L with a separate daypack. They are checked bags. Cheap Asian airlines generally don’t give you too much allowance in the cabin but they vary depending on the carrier. See Air Asia’s allowance here: http://www.airasia.com/ot/en/baggage-info/cabin-baggage.page? . There are Osprey packs (and other packs as well) that specify if they will be carry-on size. This will be for the majority of the worlds airlines but as you know flying in Europe… some airlines are really stingy when it comes to carry-ons. Best to get a bag that claims to be Carry-on size (osprey farpoint 40L http://www.ospreypacks.com/en/product/backpacking/farpoint_40 ). Hi Goats! Are you planning on doing any women’s clothing reviews? I’m about to embark on an 8 month RTW trip and am wanting to fit all my gear in a 40L, and pack ultralite clothing. Thanks heaps! Apart from those clothes, everything I own (except for one pair of jeans) is lightweight cotton. 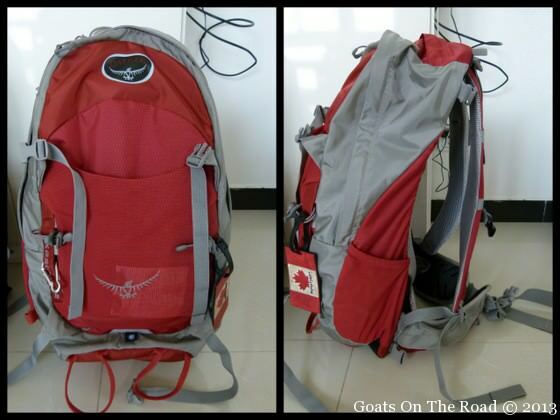 Are you still using the 55L Osprey Farpoint 55 Nick? What Items are in your medical kit? How/where do I obtain such RX from? While an older post, you have lots of great information. 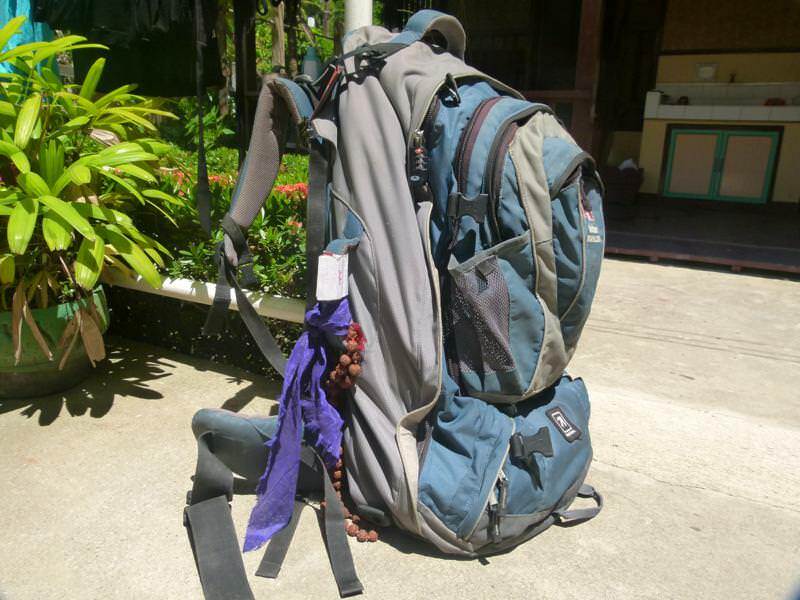 We’re big advocates of lightweight backpack travel as well and it’s nice to see others promoting it. Dariece, it looks like you had the biggest size drop of 28L. How significantly did you change your packing strategy to fit a much smaller bag? I went from a 65L Gregory to a 38L Osprey Kestrel many years ago. 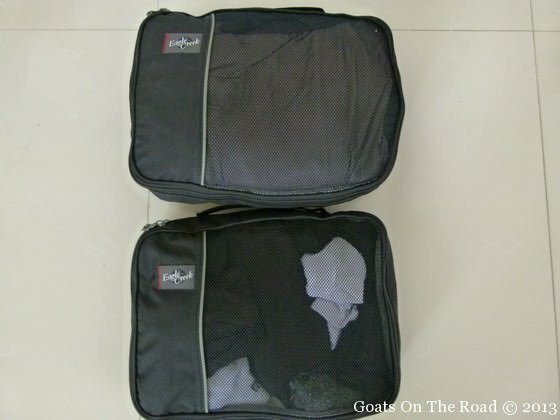 Smarter packing, compression sacks and packing cubes sure make a difference. Also, what does Nick use as an auxiliary front pack now?